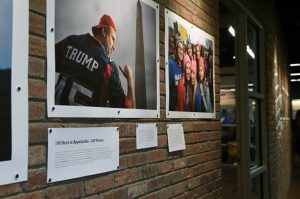 MORGANTOWN, W.Va. — The WVU Reed College of Media unveiled 100 Days in Appalachia, a photo exhibit detailing the diverse voices and people of the region, Aug. 29 at the Evansdale Crossing building. The WVU Reed College of Media unveiled 100 Days in Appalachia, a photo exhibit of the region, Aug. 29 at the Evansdale Crossing building. A partnership between the college, West Virginia Public Broadcasting and The Daily Yonder, 100 Days in Appalachia sought to capture the lives and stories of those living in the mountains, not just West Virginia, but also Virginia, Kentucky and places not typically associated with the area, such as Mississippi. Maryanne Reed, dean of the college, said the region, which overwhelmingly voted for Trump in the 2016 election, received a lot of national media coverage, but much of that focused on only a handful of issues, such as mining disasters, opioid abuse and poverty. While Appalachia does face its share of issues, Reed said the project was intended to give a candid picture during the first 100 days of Trump’s presidency.